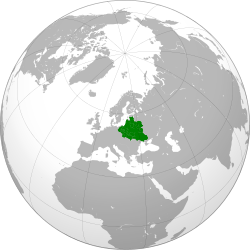 ^ Heritage: Interactive Atlas: Polish-Lithuanian Commonwealth. 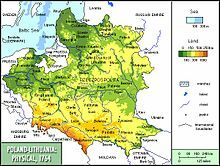 Retrieved March 19, 2006: At its apogee, the Polish-Lithuanian Commonwealth comprised some 400,000平方マイル (1,000,000 km2) and a multi-ethnic population of 11 million. 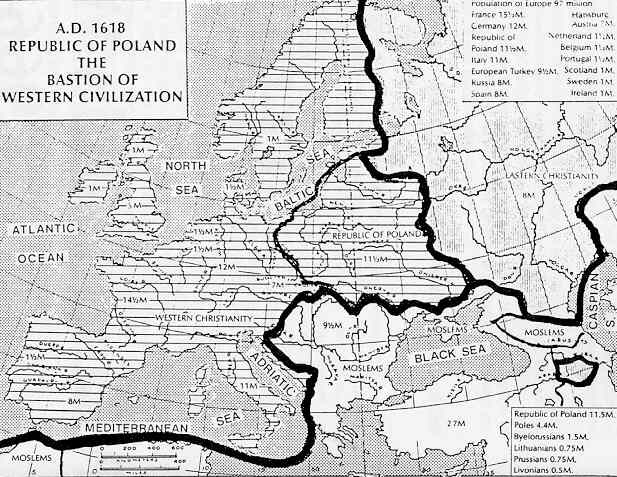 For population comparisons, see also those maps:  Archived 2013年2月17日, at the Wayback Machine.,  Archived 2013年2月17日, at the Wayback Machine..
^ Norman Davies, Europe: A History, Pimlico 1997, p. 554: Poland-Lithuania was another country which experienced its 'Golden Age' during the sixteenth and early seventeenth centuries. The realm of the last Jagiellons was absolutely the largest state in Europe. ^ This quality of the Commonwealth was recognized by its contemporaries. Robert Burton, in his The Anatomy of Melancholy, first published in 1621, writes of Poland: "Poland is a receptacle of all religions, where Samosetans, Socinians, Photinians [...], Arians, Anabaptists are to be found"; "In Europe, Poland and Amsterdam are the common sanctuaries [for Jews]". ^ （英語） Francis Dvornik (1992). 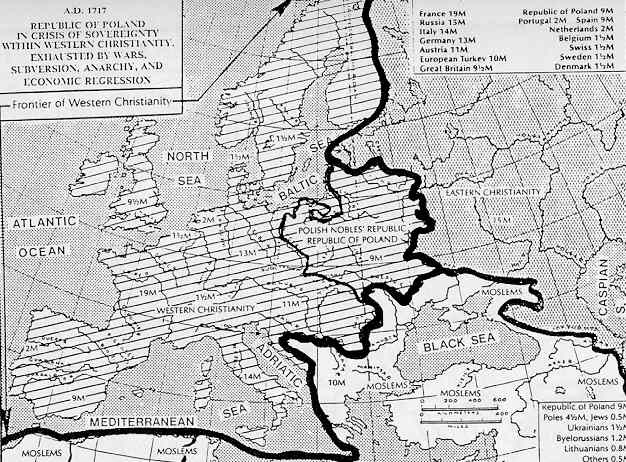 The Slavs in European History and Civilization. Rutgers University Press. p. 300. ISBN 08-13507-99-5. http://books.google.com/books?id=LACpYP-g1y8C&printsec=frontcover&hl=pl. ^ （英語） Salo Wittmayer Baron (1976). A social and religious history of the Jews. Columbia University Press. ISBN 02-31088-53-1. ^ a b Pacy, James S.; James T. McHugh. Diplomats Without a Country: Baltic Diplomacy, International Law, and the Cold War (1st Edition ed.). Post Road West, Westport, Connecticut: Greenwood Press. doi:10.1336/0313318786. ISBN 0-313-31878-6. http://books.google.com/books?ie=UTF-8&visbn=0313318786&id=wRbdAwtxVIAC&pg=PA18&lpg=PA18&dq=Union+of+Lublin&vq=autonomy&sig=gX3YrDKVd16OrwDC8RHYcz8UyVE 2006年9月3日閲覧。. ^ Frost, Robert I.. The Northern Wars: War, State and Society in northeastern Europe, 1558‐1721. Harlow, England; New York: Longman's. 2000. Especially pp9‐11, 114, 181, 323. ^ （英語） David Sneath (2007). The headless state: aristocratic orders, kinship society, & misrepresentations of nomadic inner Asia. Columbia University Press. p. 188. ISBN 02-31140-54-1. http://books.google.com/books?id=OR14qaApQbgC&printsec=frontcover&hl=pl. ^ （英語） M. L. Bush (1988). Rich noble, poor noble. Manchester University Press ND. p. 8-9. ISBN 07-19023-81-5. http://books.google.com/books?id=TIG7AAAAIAAJ&printsec=frontcover&hl=pl. ^ a b c （英語） Piotr Stefan Wandycz (1980). The United States and Poland. Harvard University Press. p. 17. ISBN 06-74926-85-4. http://books.google.com/books?id=_XaFaNshCrkC&printsec=frontcover&hl=pl. ^ （英語） Norman Davies (2005). God's Playground: A History of Poland. Columbia University Press. p. 167. ISBN 02-31128-19-3. http://books.google.com/books?id=EBpghdZeIwAC&hl=pl. ^ They were the first Catholic schools in which one of the main languages of instruction was Polish. [...] Although he followed Locke in attaching weight to the native language, in general Latin lost ground to French rather than Polish. （英語） Richard Butterwick (1998). 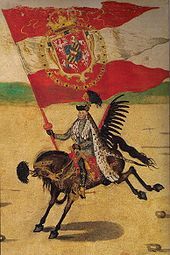 Poland's last king and English culture: Stanisław August Poniatowski, 1732-1798. Oxford University Press. p. 70. ISBN 0-19-820701-8. ^ Zinkevičius, Z. (1993). Rytų Lietuva praeityje ir dabar. Vilnius: Mokslo ir enciklopedijų leidykla. p. 70. ISBN 5-420-01085-2. 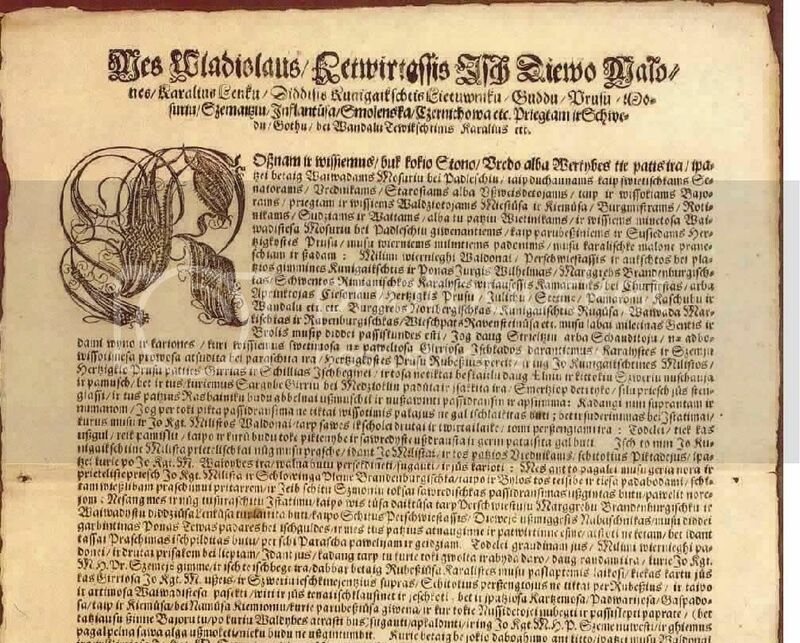 "Official usage of Lithuanian language in the 16th century Lithuania's cities proves magistrate's decree of Vilnius city, which was sealed by Žygimantas Augustas' in 1552...//Courts juratory were written in Lithuanian language. In fact, such [courts juratory written in Lithuanian] survived from the 17th century..."
^ Ališauskas, V.; L. Jovaiša, M. Paknys, R. Petrauskas, E. Raila and others (2001). Lietuvos Didžiosios Kunigaikštijos kultūra. Tyrinėjimai ir vaizdai. Vilnius. p. 500. ISBN 9955-445-26-2. "In 1794 Government's declarations were carried out and in Lithuanian." ^ a b （英語） Joanna B. Michlic (2006). Poland's threatening other: the image of the Jew from 1880 to the present. U of Nebraska Press. p. 42. ISBN 08-03232-40-3. http://books.google.com/books?id=t6h2pI7o_zQC&printsec=frontcover&hl=pl. ^ （ポーランド語） Karol Zierhoffer, Zofia Zierhoffer (2000). Nazwy zachodnioeuropejskie w języku polskim a związki Polski z kulturą Europy. Wydawnictwo Poznańskiego Towarzystwa Przyjaciół Nauk. p. 79. ISBN 83-7063-286-6. Podobną opinię przekazał nieco późnej, w 1577 r. Marcin Kromer "Za naszej pamięci weszli [...] do głównych miast Polski kupcy i rzemieślnicy włoscy, a język ich jest także częściowo w użyciu, mianowicie wśród wytworniejszych Polaków, którzy chętnie podróżują do Włoch". ^ （英語） Rosemary A. Chorzempa (1993). Polish roots. Genealogical Pub.. ISBN 08-06313-78-1.